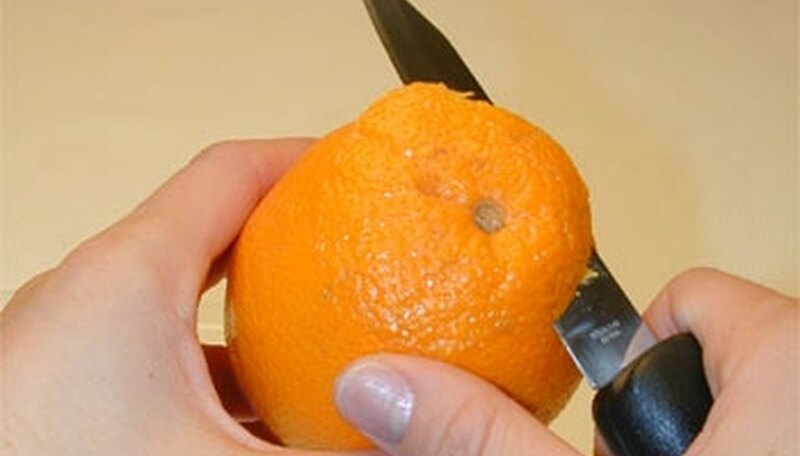 Peeling an orange with your hands is not complicated, though your hands are likely to be sticky with juice before you're done. You can keep more of the juice inside the orange, where it belongs, if you use an ordinary paring knife to segment the peel before you start pulling it way from the underlying fruit. You can also use a small sharp knife to create peel-free, membrane-free segments, or "supremes," for fruit salads or garnishes. Cut a circle of rind from the top and bottom of the orange, taking care not to cut into the fruit itself. This removes the peel from the stem and blossom ends, where it's connected most deeply to the orange. Press the knife's tip to the skin of the orange, and score it from top to bottom with a shallow cut. It should just penetrate the colorful rind and white pith, without piercing the orange. Turn the orange and repeat the downward stroke, scoring the rind into sixths or eighths. Slide a thumb under a section of the rind, at the top or bottom, and loosen the end. 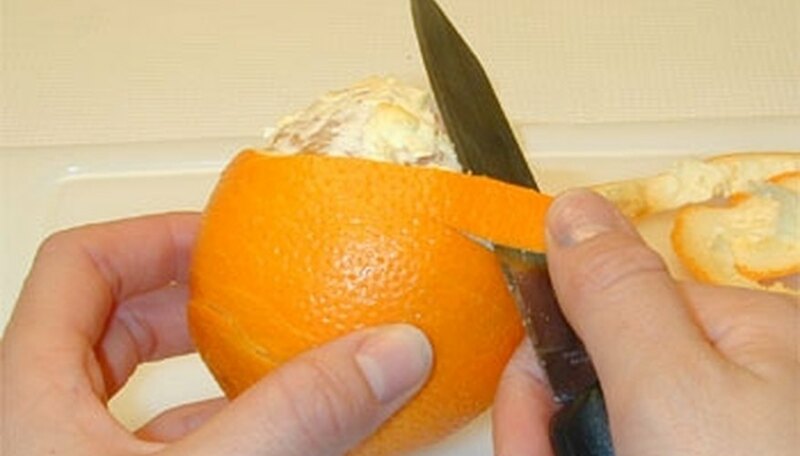 Peel the segment away from the orange in a football-shaped strip. Repeat for each remaining segment. 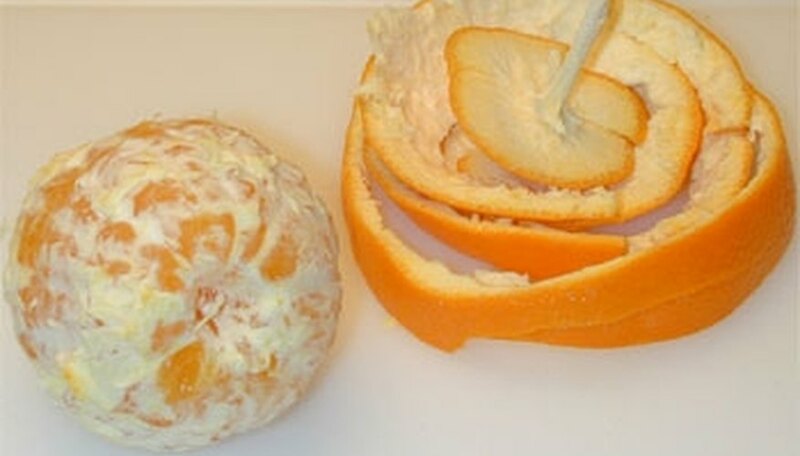 Peel away any remaining white pith from the orange, then separate it into sections for eating. Cut a thin round from the top and bottom of the orange, just deep enough to remove the top layer of its protective membrane and leave the bright, fibrous flesh exposed. Hold the orange firmly to your cutting board, and cut through the skin and pith from top to bottom. Follow the natural curve of the fruit, laying its flesh bare. Turn the orange and repeat, until it's completely bare of peel. You might need to turn the orange upside down to trim away the last of the skin surrounding its blossom end. Trim any fine strips of skin or pith remaining on the orange. Hold the fruit over a bowl, to catch the segments and juice, and position your knife alongside one of the membranse dividing the orange into segments. Cut alongside the membrane, until your knife reaches the end of that segment. Reposition your knife at the opposite side of the segment, and cut along the membrane once again. 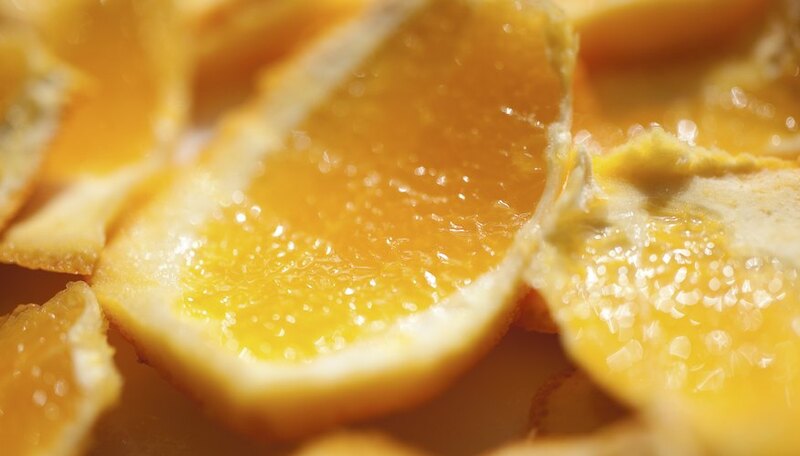 With a twist of your knife blade, a clean, membrane-free orange segment should drop into the bowl. Repeat for each remaining segment, until you're left with just the central web of membranes left in your hand. Squeeze the juice and pulp from the membranes into your bowl, to moisten the orange segments, then discard or compost the remainder. Repeat for any additional oranges, then use the segments as desired. Thick-skinned oranges, such as navels. are easiest to peel. Use the same technique to make supremes of lemon, lime or grapefruit for salads or baking. This article was created by a professional writer and edited by experienced copy editors, both qualified members of the Demand Media Studios community. All articles go through an editorial process that includes subject matter guidelines, plagiarism review, fact-checking, and other steps in an effort to provide reliable information.